Remember the cranky blackboard that Mr. Squiggle used for an easel? Blackboard’s catch-phrases are applicable to the 2014 Crows. All on their payroll should heed the be-chalked one’s gruff proclamations. 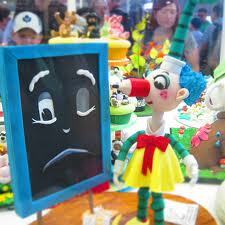 In 1999 mere months after Adelaide’s second, and seemingly final premiership, Mr Squiggle was axed. However, there wouldn’t be a kid on your street who’s heard of Gus the Snail or Bill the Steam Shovel. The Adelaide Football Club is the now underperforming Harvey Norman salesperson who previously played bass in the long defunct, forgotten band that opened for Powderfinger, before a half-empty Thebby twenty years back. They’re becoming the quiz night question, that no-one gets. Not even that young, skinny physics teacher who ambled in alone, and is drinking diet coke. The autopsy states the Crows’ season died as the siren sounded in Sydney when Richmond knocked off the minor premiers. But misery can be complex. Was it actually last week against North? And the defibrillator was whirring during those home losses against the Tigers, West Coast and Melbourne. Or was it already on the fritz way back on that balmy Saturday in April after the Swans spanked us at home? When we were 0-3 with the ambulance already shrieking towards War Memorial Drive? St Kilda start brightly, and register the first major. It takes the Crows ten scrappy minutes to score courtesy of Taylor Walker. The visitors dominate play, but fail to assemble any scoreboard pressure. Kicking like Mark Waugh used to bat, he then gets another. A Tex roost is among our code’s joys. Plainly dejected, Bruce McAvaney has left the growl home at Glenelg South. His descriptions reflect the stature of the match. It is an exhibition game between the locals, who, like Bob Dylan in concert, are maddeningly erratic. And we’ve got the AFL’s eighteenth best side. In a spurt, Adelaide inserts five goals and smotes the Saints. Suddenly, it’s an unpleasant mismatch, like a professional footballer setting fire to a hired dwarf on Mad Monday. At one terrifying point in the second quarter the commentary team go a complete minute without mentioning Lenny Hayes’ retirement. The Channel 7 receptionist has me on hold, and then, over the muzak, I hear Tom Harley reminding us the Saints star is the all-time leading tackler. Wow-wee! Adelaide and St Kilda exchange easy goals early in the second half. Whilst there are six-pointers aplenty, the contest now has less fizz than flat Fanta. Mrs Rutten is well thrilled as her Ben kicks a goal with his last kick in AFL, due to a handball from that most scarce of footballing creatures, the unselfish, crumbing forward. Eddie Betts is then compensated with the fifth major of his own in a fifty goal season. Of some interest to the crowd is the third stanza moment when the Crouch brothers are on deck together for the first time. They’ll provide substantial midfield grunt for many seasons. Of course, they’re the first siblings to wear the tri-colours since the Jarmans, who are now providing substantial midriff grunt. Game over, but questions remain. Did Farren Ray and Spencer White co-star in a string of 1930’s Hollywood musicals? Why is Leigh Matthews still in the media, when Basil Zampelis is offering his considered insights? Did James Podsiadly play for Geelong? And, if you had the choice, who would you take to a Hugh Grant rom-com: David Armitage or Samantha Armytage? Listen. You can hear it. On a distant AM radio. So tonight I’m gonna party like it’s 1999. Yes, it is Prince. When Mark Bickley last thrust the cup aloft, 1999, somehow, remarkably, hadn’t yet happened. 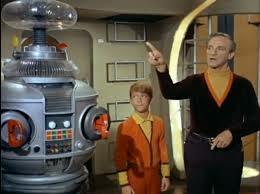 Like The Jetsons, the song was in the delicious, crazy future. With an official mission launch date of October 16, 1997, Jupiter 2 of the cult TV series Lost in Space was, at least narratively, drifting silently about the galaxy when The Crows last triumphed. And Dr Zachary Smith was the show’s enemy agent and saboteur. Brilliant blog Mickey. Will be checking in regulary. Keep up the great work, look forward to another steak and shiraz with you one day! Thanks Luke. I’m going to the Grand Prix here tomorrow, but not for the motor sport. Seasick Steve is playing! Looking forward to my next Almanac lunch at some point in 2015 and catching up with you!